Two long time listings in Little Holmby and Westwood Hills both receive accepted offers on the same day. 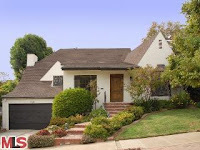 This Westwood Little Holmby property at 10541 Strathmore Dr, LA CA 90024 lasted a brief 337 days on the market before receiving an accepted offer on 2/1/2010. The home was listed 2/12/09 and received 2 price reductions during the current listing term. This home was also for sale in 2008 for 211 days, starting as high as $2,795,000. So this home has literally been for sale for 2 years. One of the challenges of this property has been the multi-level choppy floorplan. The high starting price last year of $2.795 didn't help either. I will say that the house has some charm and you can move right in and live as is. According to public records the home is a 5 bed / 4 bath, 2,919 sq ft home on a 7,056 sq ft lot. The Westwood Hills home at 11247 Homedale St, LA CA 90049 lasted 79 days on the current listing period before accepting an offer on 2/1/2010. The home was previously on the market for 340 days, starting at the end of 2008, with an asking price starting at $1,799,000. I didn't think this home had any major fatal flaws to keep it from selling, other than the high asking price of $1.799k. The home has modest updating throughout and is very clean and liveable. According to the MLS, the home is a 3 bedroom / 2.5 bath, 1,979 sq ft of living space on a 6,390 sq ft lot.